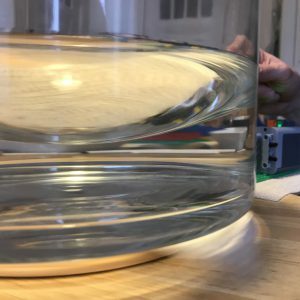 Inspired by the article “Affordable Rotating Fluid Demonstrations for Geoscience Education: the DIYnamics Project” by the Hill et al. 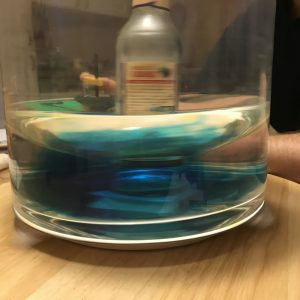 (2018), I spent a fun Sunday afternoon with my friends Joke and Torge in their kitchen, playing with Legos, water and food dye. 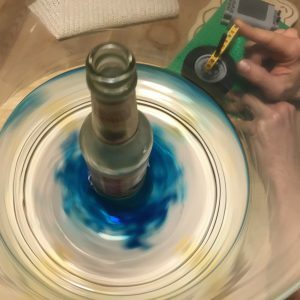 But we got it to spin! Look at the cool paraboloid surface! 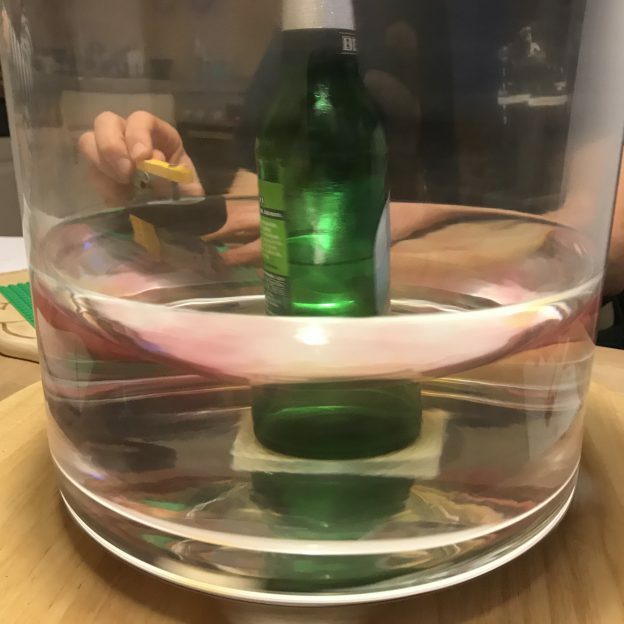 Next issue, though: my awesome glass vase which looks like it should work well as a tank has a really irregular bottom, which makes it very difficult to have anything stand in the centre without too much of a wobble. Also, for the Hadley Circulation experiment we were trying to set up here, when do you add in the cooling in the center? Would be best to do it after the tank is spun up, but that is such a pain to do! And I messed up the dye here, too. But at least you can see a little bit of what it will be like when we are done, right? 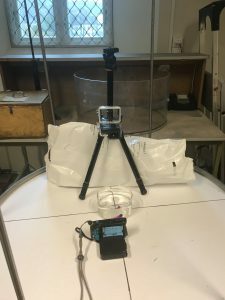 This entry was posted in kitchen oceanography, tank experiment and tagged Hadley cell, kitchen oceanography, rotating tank, tank experiment on January 27, 2019 by mglessmer. You know I like tank experiments, but what I am lucky enough to witness right now is NOTHING compared to even my wildest dreams. 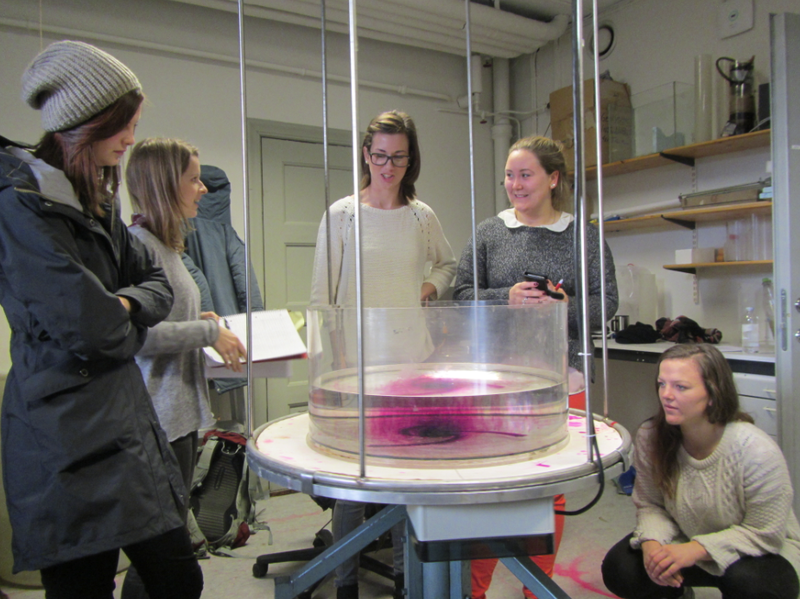 Remember all the rotating experiments we did with this rotating table back in Bergen? Those were awesome, no question about that. But the rotating tank I am at now? 13 meters diameter. Yes, you read that correctly. 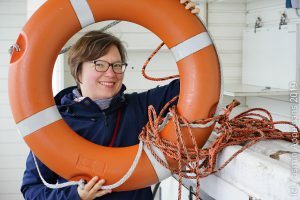 13 METERS DIAMETER! Follow the blog, or like us on Facebook! Yes, they are both INSIDE the tank. 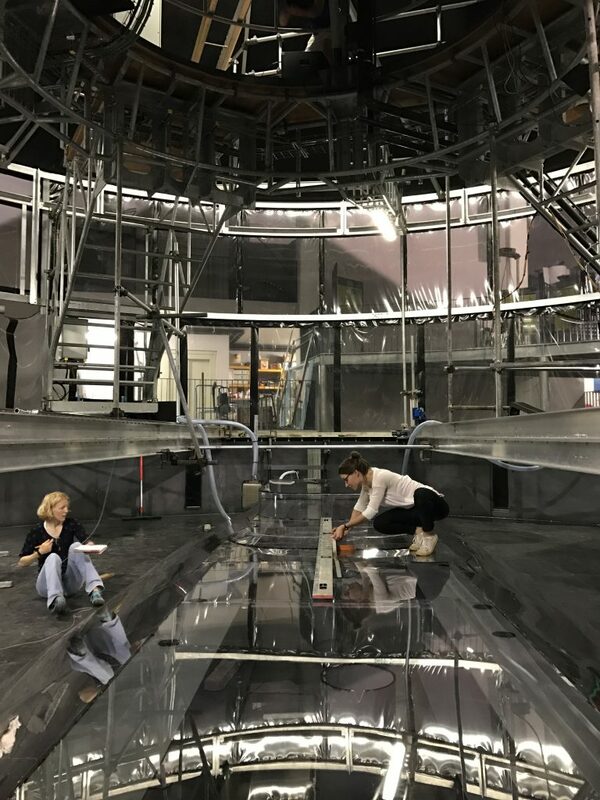 Elin (on the left) is sitting on the tank’s floor, Nadine (on the right) is climbing on the topography representing Antarctica. For more details, head over to the blog! 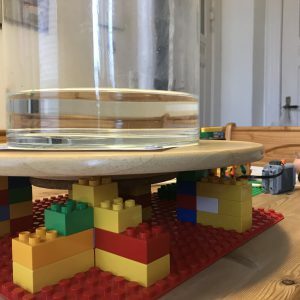 This entry was posted in Uncategorized and tagged Coriolis, experiment, Grenoble, rotating tank on September 7, 2017 by mglessmer.